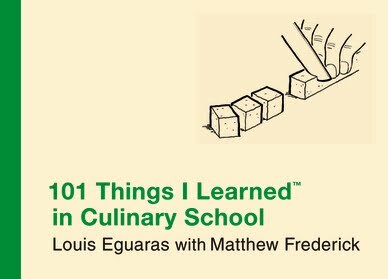 Louis Eguaras, a renowned chef at the Le Cordon Bleu Program at the California School of Culinary Arts, provides readers with a terrific overview of what is truly involved in the preparation, cooking, and presentation of meals. He also provides invaluable insights into just what is involved in making this one's chosen profession. The book will feature a wide range of illustrated lessons, from how to properly hold a knife... to the history of food... from food preparation and presentation... to restaurant hospitality and management, and much more. I am a foodie and I love to cook. However, there are tons of things that I do not know how to do. I am always interested in learning more, so I was thrilled to receive a copy of 101 Things I Learned in Culinary School by Louis Eguaras and Matthew Frederick. This book is amazing! While some of the things I learned in this book are things that are strictly for restaurants, most of it is useful to any level cook and all of it is good reading! I learned about the different cuts of meat, how to boil a lobster, which cheeses melt the best, the difference between Sushi and Sashimi, how to prepare salad greens and so much more. There are even some fun facts and quotes. If you enjoy food, cooking or even if you want to begin a career in culinary school, this book is for you. Giveaway ends 6/14/10 at 9pm EST. Giveaway is for US residents only. No P.O. Boxes. Winner will be chosen randomly. Winner will be contacted via e-mail and then will have 48 hours to respond before a new winner will be chosen.